Description: A spreading branched herb. It lies flat on the ground. It grows each year from seed. The plants spread 10 to 50 cm wide. The stems are purplish. The leaves are fleshy, flat and shaped like a wedge at the base. They are 1.5 to 2.5 cm long and 0.3-1 cm wide. The flowers are yellow and occur in a few rounded heads. They are 0.8-1.5 cm across. They bloom about the middle of the day. The capsules are 0.5 cm long and oval. The seeds are black and shiny. Notes: Widely used in East Mediterranean countries, archaeobotanical finds are common at many prehistoric sites. In historic contexts, seeds have been retrieved from a protogeometric layer in Kastanas, as well as from the Samian Heraion dating to seventh century B.C. In the fourth century B.C., Theophrastus names purslane, andrákhne (ἀνδράχνη), as one of the several summer pot herbs that must be sown in April. As portulaca it figures in the long list of comestibles enjoyed by the Milanese given by Bonvesin de la Riva in his “Marvels of Milan” (1288). In antiquity, its healing properties were thought so reliable that Pliny advised wearing the plant as an amulet to expel all evil. 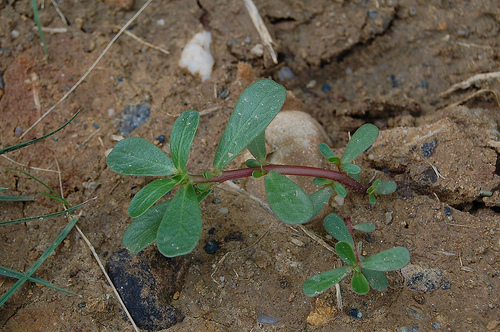 A common plant in parts of India, purslane is known as Sanhti, Punarva, or Kulfa. Edible Uses: Leaves and stems – raw or cooked. The young leaves are a very acceptable addition to salads, their mucilaginous quality also making them a good substitute for okra as a thickener in soups. Older leaves are used as a potherb and have a somewhat sour, spicy and salty taste. Purslane is eaten throughout much of Europe, the middle east, Asia, and Mexico. The stems, leaves and flower buds are all edible. Australian Aborigines use the seeds to make seedcakes. Greeks, who call it andrakla (αντράκλα) or glystrida (γλυστρίδα), fry the leaves and the stems with feta cheese, tomato, onion, garlic, oregano, and olive oil, add it in salads, boil it or add to casseroled chicken. In Turkey, besides being used in salads and in baked pastries, it is cooked as a vegetable similar to spinach. In Albania it is called burdullak, and also is used as a vegetable similar to spinach, mostly simmered and served in olive oil dressing, or mixed with other ingredients as a filling for dough layers of byrek. In the south of Portugal (Alentejo), “baldroegas” are used as a soup ingredient. Because of its high water content Purslane cooks down quite a bit. Pick more than you think you will need. Makes a quick cold soup in hot weather by cooking and blending together with other vegetables.The leaves are a source of omega-3 fatty acids and can be dried for later use. The leaves contain per 100g ZMB. 245 – 296 calories, 17.6 – 34.5g protein, 2.4 – 5.3g fat, 35.5 – 63.2g carbohydrate, 8.5 – 14.6g fibre, 15.9 – 24.7g ash, 898 – 2078mg calcium, 320 – 774mg phosphorus, 11.2 – 46.7mg iron, 55mg sodium, 505 – 3120mg potassium, 10560 – 20000ug B-carotene equivalent, 0.23 – 0.48mg thiamine, 1.12 – 1.6mg riboflavin, 5.58 – 6.72mg niacin and 168 – 333mg ascorbic acid. Seed – raw or cooked. The seed can be ground into a powder and mixed with cereals for use in gruels, bread, pancakes etc. The seed is rather small and fiddly to utilize. 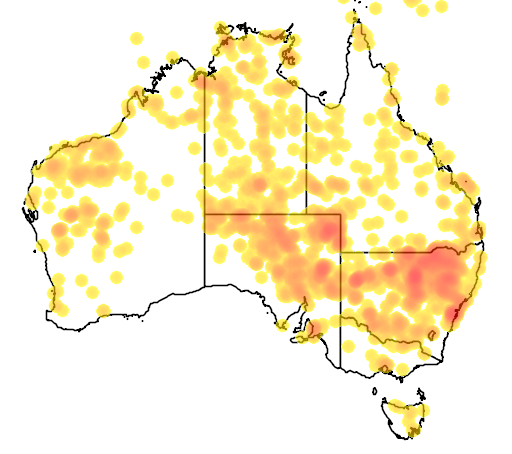 In arid areas of Australia the plants grow quite large and can produce 10, 000 seeds per plant, a person can harvest several pounds of seed in a day. The seeding plants are uprooted and placed in a pile on sheets or something similar, in a few days the seeds are shed and can be collected from the sheet. The seed contains (per 100g ZMB) 21g protein, 18.9g fat 3.4g ash. Fatty acids of the seeds are 10.9% palmitic, 3.7% stearic, 1.3% behenic, 28.7% oleic, 38.9% linoleic and 9.9% linolenic. The ash of burnt plants is used as a salt substitute. Medicinal Uses: Antiscorbutic; Depurative; Diuretic; Febrifuge; Skin; Tonic; Vermifuge. Medicinal Information: The plant is antibacterial, antiscorbutic, depurative, diuretic and febrifuge. The leaves are a rich source of omega-3 fatty acids, which is thought to be important in preventing heart attacks and strengthening the immune system. The fresh juice is used in the treatment of strangury, coughs, sores etc. The leaves are poulticed and applied to burns, both they and the plant juice are particularly effective in the treatment of skin diseases and insect stings. A tea made from the leaves is used in the treatment of stomach aches and headaches. The leaf juice is applied to earaches, it is also said to alleviate caterpillar stings. The leaves can be harvested at any time before the plant flowers, they are used fresh or dried. This remedy is not given to pregnant women or to patients with digestive problems. The seeds are tonic and vermifuge. They are prescribed for dyspepsia and opacities of the cornea. 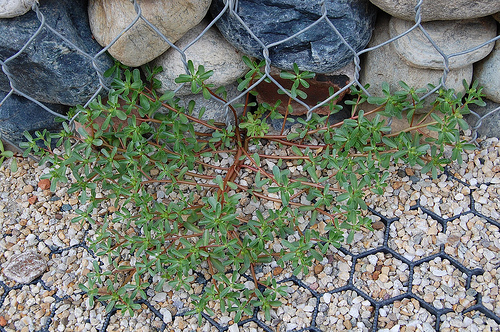 Other Uses: As a companion plant, Purslane provides ground cover to create a humid microclimate for nearby plants, stabilizing ground moisture. Its deep roots bring up moisture and nutrients that those plants can use, and some, including corn, will “follow” purslane roots down through harder soil that they cannot penetrate on their own (ecological facilitation). It is known as a beneficial weed in places that do not already grow it as a crop in its own right.